Although many might believe that somehow God gave us a “holy language” and a “Bible dropped from heaven”, for the rest of us we have to wrestle how it is that we came to have the Scriptures we have today. Now, if we believe in at least essential Mosaic authorship of the Pentateuch (the Post-Mosaica adequtely barring the notion that Moses wrote all of the Pentateuch) and a Post-exilic writing of at least some of the Hebrew canon, there is around 1000 years between Genesis and Malachi. Now, the question is this. How is it that we have a fairly unified Hebrew throughout the Hebrew Scriptures even though the writing supposedly spans a thousand years? 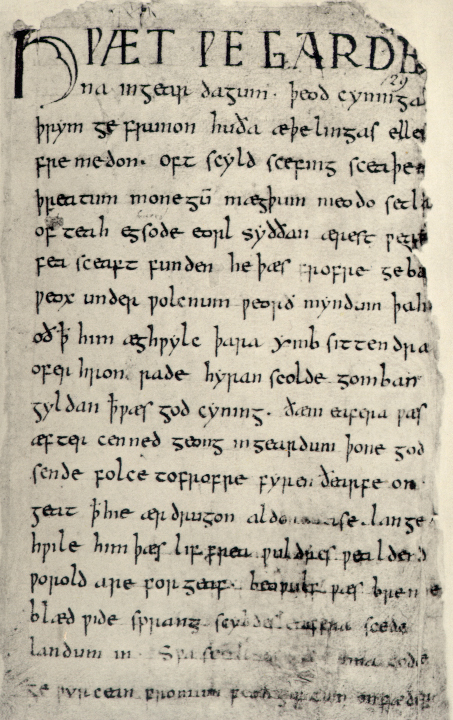 In case you don’t think that languages change significantly over the years, I have posted an image of a Beowulf manuscript in English from around the year 1100 (around 1000 years). Let me know if you can read it. So then, do we accept what many would suggest, that most of the Old Testament was written in the Post-exilic period or do we allow for substantial linguistic updating (along with some evident redaction)? Or is there another option?